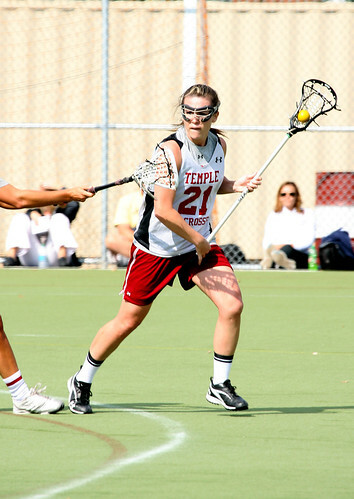 Senior midfielder Stephanie Markunas cradles the ball in a game during the Philly 5 Tournament on Oct. 1. The Owls return their Top 3 scorers from last season’s offense. Coming off a promising fall season, the lacrosse team is prepared to make a run at the Atlantic Ten Championship this spring. This year’s team has the potential for success with nine seniors who all saw playing time last season and a plethora of young talent. Coach Bonnie Rosen is confident that this group has the tools to improve upon last season (7-10, 5-2 A-10) and establish themselves as a premier lacrosse program in the A-10. The fall season was instrumental in cementing that confidence. Rosen said she typically prides herself on being a defensive-minded coach, but admitted that she believes this team’s ability to score is going to be vital to their success. Rosen added that the team’s common belief that a title is within reach is binding them together. At the core of the Owls’ chemistry is a pair of the team’s top goal scorers, senior midfielders Stephanie Markunas and Missy Schweitzer. Characterized by Rosen as “scrappy” and notable for her strong work ethic, Schweitzer is set to lead the team to new heights. Last year, she was second on the team in goals with 25 and also second in assists, with seven. This year, Schweitzer said she is excited to step into her new role as a team leader. Markunas will be an equally important component if this team is to succeed. Described by her coach as a “field general,” she will be the one who sets the tone and takes control on the field. As for these two players, they appear to be just as optimistic about their chances as Rosen. To accompany Markunas and Schweitzer, the Owls return a duo of offensive weapons in junior midfielder Charlotte Swavola, who lead the team in goals last year with 38, and junior midfielder Stephany Parcell, who tied for second on the team in goals along with Schweitzer, with 25. Rosen said she is also excited about sophomore attacker Jaymie Tabor, who was a standout during the fall season. “[Tabor] really started to step up in pressure situations,” Rosen said. Talent is not the only ingredient of a great team, however. Rosen also noted that this team has a unique chemistry that she hopes will translate into victories on the field.